An existing client of required to re-design the kitchen. Having dome lots of work for the same client previously, it was clear that new and boundary pushing ideas would be welcomed and any unique solutions would be considered. The client liked a contemporary, no fuss design. However, a clinical and minimalism look would not be accepted, as some warmth and colour was required. The design was developed which was challenging, it was not impossible. The design of this kitchen was approached from a different angle on this project. Once the essential lay out was completed, it was viewed as a carcass of the furniture, which then required beautifully designed doors with carefully selected colours applied to it. The next step was to design the overall look of the kitchen and contrast panels creating interest and visual diversity. This kitchen was designed like any piece of furniture, without any constraints of what the "normal" modern kitchen should look like in high gloss finish and handle-less doors. A velvety matt finish was selected for the doors using three colours which achieved a balanced effect with contrast decorative panels. The overall colours scheme is neutral and restful, in subtle complex shades of grey and taupe. The lighter and darker colours punctuate the larger expanses of the main colours. Different colours were chosen for different parts of the kitchen. A ceiling panel with LED lights was added to visually connect the main part of the kitchen with the cooking area on the centre island. The original plans had to be scaled down and some ceiling panelling was lost due to the building constraints. However, the desired effect was still achieved. The sitting area with a large TV was designed to be comfortable and stylish with bright blue colours bringing the whole room to life. 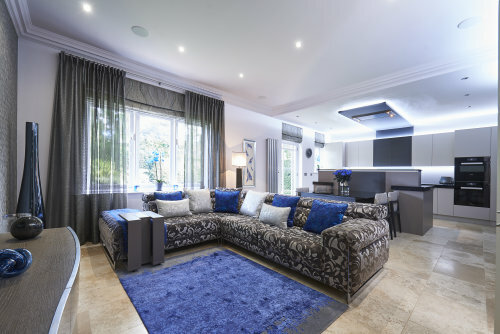 The blue colours are picked out on the bespoke rug, scatter cushions, Italian glassware which is displayed in the purpose built niche completely mirrored inside and even in the blue flowers! The rest of the furnishings like curtains and blind are neutral along with the textured wallpaper providing a perfect back drop for this amazing kitchen. There are other practical aspects that were considered in this design, like a low back sofa, which has retractable headrests, which are so useful when watching the TV. The sofa was made in a self patterned velvet which brings some fun in to the otherwise restrained design. An informal dining table was created as an integral part of the centre island. The dining chairs also had some fun injected in to them with the snake skin printed metallic fabric. The client was thrilled with the result!